Atop the International Commerce Centre in Kowloon, The Ritz-Carlton, Hong Kong, is the highest and one of the most luxurious hotels in the world. Ideal for both business and leisure travellers, the hotel occupies floors 102 to 118 of the ICC building and features 312 guest rooms which all offer spectacular views of Victoria Harbour and the city which is one of the most thriving in Asia. The hotel features six dining venues including the state-of-the-art Michelin-starred Italian restaurant, Tosca; two-star Michelin Chinese restaurant, Tin Lung Heen; Almas Caviar Bar serving the finest selection of caviar and Balik salmon; The Lounge and Bar, which features an international all-day dining menu; and Café 103, which serves signature chocolate afternoon tea. The rooftop bar, Ozone, is the highest bar in the world at 490 meters above sea level and is well-known for its classic cocktails and outdoor terrace. When it comes to relaxation, The Ritz-Carlton Spa, Hong Kong, located on the 116th floor, features nine deluxe treatment rooms and two couple’s suites, which also feature spectacular views over the city. The 118th floor of the hotel is home to a fully equipped fitness center and an indoor pool area adorned with a mirrored ceiling and high-resolution LED wall. To find out what makes the hotel so unique, WAYFARER Host and Editor-In-Chief spoke with The Ritz-Carlton, Hong Kong General Manager, Pierre Perusset. To view the interview, click on the video below. The best way of getting to Hong Kong in comfort and style. 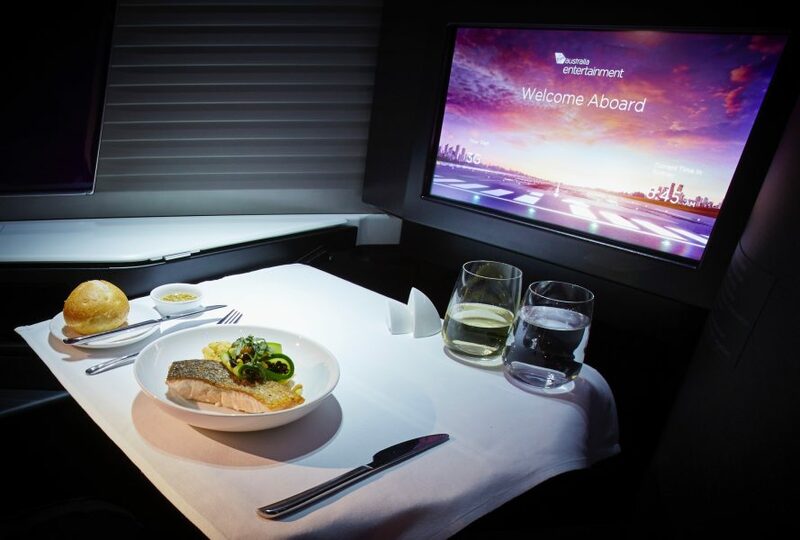 Virgin Australia’s service and offering on the wide-body Airbus A330s that make the hop to Hong Kong from Melbourne and Sydney is exceptional and onboard, expect top Australian produce, wine and beer from nose to tail alongside seat-back entertainment. In luxury cabin ‘The Business’, find spacious mini-suites that include a flatbed seat that extends out to 80 inches (203cm), storage spaces and on the entertainment front, 16 inch touch screens that feature over 500 hours of movies, TV shows, games and more. Premium noise-cancelling headphones are also offered. When it’s time for a nap, expect a turn down service that features a large pillow and a doona as well as pyjamas and an amenity kit. Onboard, also find a restaurant-style dining experience that will be served on demand when you’re ready. The menus are courtesy of resident chef, popular Sydney-based restaurateur Luke Mangan, who has created both Western and Asian dishes for the flights to Hong Kong. Before you take off, there is priority check-in, lounge access in Australia and Hong Kong and priority boarding followed by a glass of sparkling wine when you reach your seat.